On behalf of the Organizing Committee, we are honoured to introduce you to the 6th International Conference on Ageless Aging (ICAA 2018). The rapid aging of population worldwide has brought unprecedented social economic challenges to the society. Apart from physical, cognitive and emotional difficulties faced by senior citizens, two new types of challenges – social challenges and sustainable economic development challenges – are becoming more prominent. Research and technology that will enable the elderly to lead an active, independent and dignified lifestyle are urgently needed. 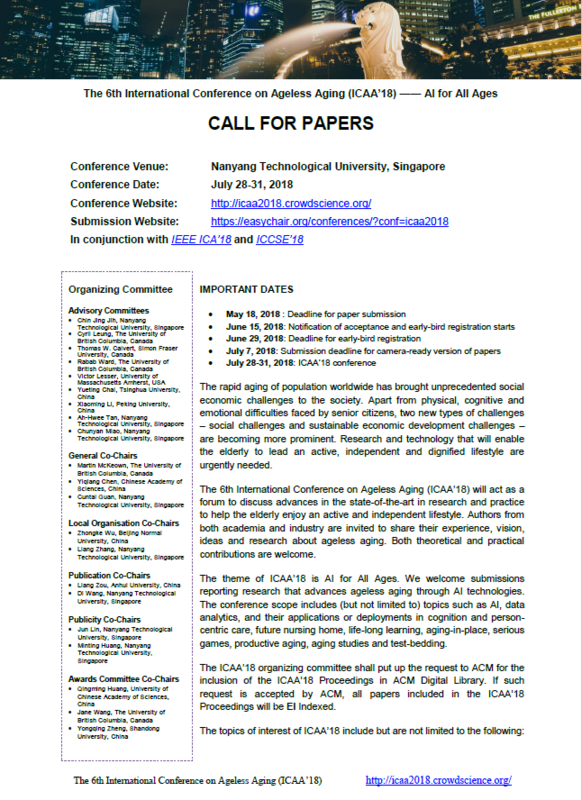 The 6th International Conference on Ageless Aging (ICAA’18) will act as a forum to discuss advances in the state-of-the-art in research and practice to help the elderly enjoy an active and independent lifestyle. Authors from both academia and industry are invited to share their experience, vision, ideas and research about ageless aging. Both theoretical and practical contributions are welcome. The theme of ICAA’18 is AI for All Ages. We welcome submissions reporting research that advances ageless aging through AI technologies. The conference scope includes (but not limited to) topics such as AI, data analytics, Internet of things (IoT), human-computer interaction (HCI), and their applications or deployments in cognition and person-centric care, future nursing home, life-long learning, aging-in-place, serious games, productive aging, aging studies and test-bedding. The emphasis of this track is on visionary ideas, long-term challenges, and new research opportunities. This track will serve as an incubator for innovative approaches, provocative ideas, and to propose challenges and opportunities for the field in the near future.